Haul garbage bags full of empty cans to the recycling landfill. I am sure what you REALLY want to know is does it taste good? I worried a little too. I'm a girl who can tell the difference between a Coke and Pepsi so I wasn't sure if this would fly in our home. I thought it was perfect, but knowing Todd's adoration of diet coke, I knew his opinion would be the deal breaker. One night, I nervously poured him a glass of the Sodastream diet coke and patiently waited for his response and doubted that he would like it. To my astonishment, he LOVED it. I too, was immediately hooked. In the last three months, I have purchased the diet coke, coke, coke zero, diet pink grapefruit (my favorite,) diet lemon lime, diet ginger ale, and used it just as soda water. All of them have been great and taste just like the main brand named sodas, if not better! You can purchase a starter kit for $59.99-$79.99 depending on which model you prefer. (They are usually marked higher than that, but don't pay full price as they are always on sale.) In the starter kit, you receive a C02 tank, the re-usable 1 liter bottle, the soda maker, and a variety of soda syrups to try. 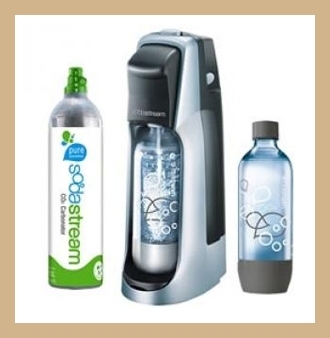 Many main stream stores like Kohls, Target and Bed, Bath, and Beyond carry the Sodastream sodas. They come in 16.9 oz bottle and that makes the equivalent of 33 cans! All in all, I LOVE this product. I have ZERO complaints. I no longer have to carry soda in and out of the grocery store and then find somewhere to store it. My recycling is 3/4 less than it used to be. But the best part? We are no longer consuming diet soda that contains aspartame. Do you own one? Do you love it? I would love to hear your thoughts! Note: This review is based solely on my own opinion as a consumer and I was not in any way asked by Sodastream to write this, or any store mentioned in this review.